There are so many new planners and journals available today, that it is hard to determine which one is right for you. There is the Purposeful Planner and the Passion Planner and the Erin Condren Planner. These are all great to get your life planned and organized. And I settled on one this year I love. When I started looking at journals, I wasn’t even sure what I was looking for. I knew I wanted a guided journal. I knew I wanted a journal that lasted a certain number of days and was not too long. I also knew I wanted a journal that helped with my health and wellness. My health is something that was put on the back burner due to our insanely busy lives. I hate using the word busy, but there really was no time to make my health and wellness a priority until I left my 9-5 job. I am a part of an amazing online group where people are dreaming and building and taking chances to be the best they can be. 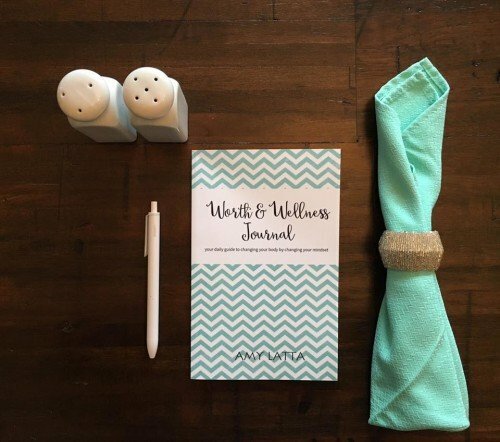 I was intrigued when I saw a post from my friend Amy Latta about her Worth and Wellness Journal. I was lucky enough to get a sneak peek and to use the journal! Circumstances > Thoughts > Feelings > Actions > Results = This is the heart of why we do what we do. Sow a thought, eventually reap an action, which will either positively or negatively impact your circumstance. The 30-day Worth & Wellness Journal is a workout plan, nutrition guide, self-care advisor, and therapist. It is designed to bring a greater level of self-awareness in various areas of your life and to help you discover why you self-sabotage your goals, in particular, your own weight loss goals. Health and fitness education will only get you so far. You need the tools to help you mentally choose, and sometimes fight, to become healthy and understand your worth. This journal provides practical nutrition, fitness, and self-care tips for better wellness, and daily writing prompts to help you become more aware of the thoughts and feelings affecting your mindset. As in all things, awareness is the key to any change. When you change your mindset you have the ability to change your body. Each day focuses on two areas, your worth and your wellness. The Wellness Focus focuses on 3 sections: Nutrition, Fitness, and Self-Care. In the fitness portion, you are given 3-5 exercises to do that day. This journal provides practical steps to do immediately. The Worth Focus asks several questions to help you dig deeper to understanding why you do what you do. Each day has an area to brainstorm, sketch, or mind-map. If you are looking for a simple tool with great impact, I want to encourage you to pick up your own copy of the Worth and Wellness Journal today. Click here to get your copy.